Once upon a time, I did a course on building your own application framework with ASP.NET MVC 5. One of the most popular techniques I showed in that course was how to attach a alert message to any ActionResult, so that you could consistently display success, warnings, etc. in your app. The bad news is that the code doesn’t port exactly to ASP.NET Core. The good news is that it is mostly the same in ASP.NET Core. Let’s take a look! 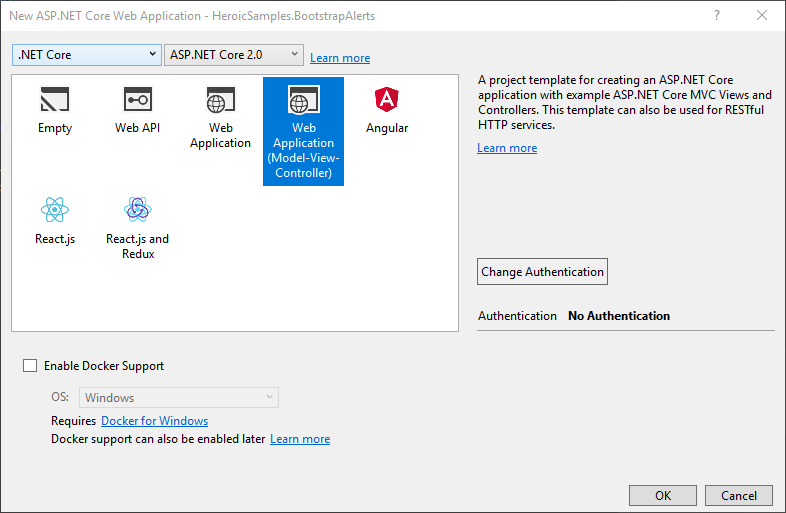 For the sake of consistency, we’ll go through this exercise starting with a brand-new, freshly-minted ASP.NET Core application. Go ahead and build and run the app, just to make sure everything works. I’ll wait. Now we’re ready to start adding our code! We’re going to use normal Bootstrap markup to display our alert message. We want this alert message to potentially be shown anywhere in our application, so it makes sense to place the message in our primary layout. I like to keep things as componetized as I can, so we’ll be making a partial view. Let’s pretend that view already exists. <strong>Hello, world!</strong> This is a sample alert! That’s cool and all, but we don’t want our partial to show on every page with the same static text. Don’t worry though, we’ll come back and fix that shortly! The goal of this exercise is to allow us to easily attach alert messages to action results, and have those alerts show up in our UI. We’ll accomplish that using extension methods. NOTE: The names you use don’t really matter. I chose these names because I’m using Bootstrap. You could easily adapt this approach for any other CSS framework, or you could choose to decouple the extension names here from the target CSS framework entirely. It’s totally up to you! We know what we need to build now. Let’s make it real! We’ll start by creating a new class in our project (in a new folder! ), “`/Extensions/Alerts/AlertExtensions.cs““. Each is basically the same: it calls a helper, Alert, with the parameters necessary to show the various types of alerts. That Alert method is where the magic happens! Yep, that’s it! All done. Oh wait, no it isn’t! AlertDecoratorResult doesn’t exist yet! But once it does, it will decorate the real action result, layering on our alert message behavior. Now, this approach isn’t perfect. One of the things I don’t like about it is that it complicates unit testing. Now your tests will have to unwrap the decorated result if they want to make any assertions about the real, underlying result. But, there are elegant ways to deal with that, which I’ll cover in a future post. For now, let’s create our actual decorator result! So far, all our result is doing is grabbing the real result, the alert type, title, and body, and storing them in properties so that we can access them from our tests. We need to put those somewhere useful… somewhere that we can access them later from within our view. And for that, we’ll use TempData! In .NET Core, we can ask for a ITempDataDictionaryFactory whenever we want to access TempData. Let’s do that in our ExecuteResultAsync method, then let’s store our alert properties there! //      this overload of GetService won't be available! If you aren’t familiar with TempData, just think of it as session data that is only accessible once. It will survive one full roundtrip, even across Post-Redirect-Get requests, and that’s it. Want to know more about TempData? Check out the Microsoft docs! One question that is immediately asked when I show this technique: “why use TempData instead of ViewBag? ?” ViewBag works fine for ViewResults! It does not work for anything else, including redirects. I’ve put together a small sample app to show off this technique. You can clone it from its repo here: HeroicSamples.BootstrapAlerts. This code works, but there’s a lot we could do to improve it. There are some magic strings lingering in the code, and it won’t actually work with JSON results yet, either. But you get the idea! Wonderful! Can’t wait for the follow up 🙂 Thanks alot Matt. It seems very interesting but I’m struggling trying to adapt it for razor pages. Would you have any clue (e.g when using in method like “public async Task OnGetAsync” or with “Return Page()”)? Hmm, good question! I haven’t thought about how to adapt this approach for Razor Pages. I’ll do some digging and see what I can come up with!